Newcomer Family Obituaries - Mary E. Barnhart 1942 - 2018 - Newcomer Cremations, Funerals & Receptions. 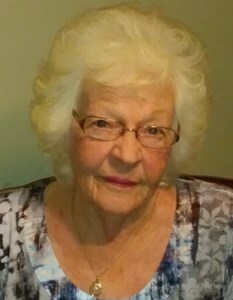 Barnhart, Mary E. age 76, of Fairfield, Ohio passed away on Thursday, November 8, 2018. She was born in Williamsburg, Kentucky on January 4, 1942 to the late Willie and Ernie Garrett (nee Jeffers). She was preceded in death by her husbands, Troy Carr and James Barnhart, Sr.; siblings, Shirley Monhollen, Everett Garrett, Lee Garrett, James Garrett, Manuel Garrett, and Joe Garrett. Mary is survived by her beloved main squeeze, Curt Chapman; daughters, Cathy (Charles Jr.) Jackson and Sherri (Keith) Sharp; grandchildren, Nikki (Steve) Begley, Jeni Sharp, and James Jackson; great-grandchildren, Austin Begley, Tyler Begley, Riley Jackson, Philip Jackson, and Brenden Jackson; sisters, Estelle Sharp and Dorothy (Dewey) Brown; furbaby, Gidget; and a host of other family members and friends. Visitation will be held on Sunday, November 11, 2018 from 3:00 pm - 6:00 pm at Newcomer Cremations, Funerals & Receptions - Northwest Chapel, 7830 Hamilton Avenue, Cincinnati, Ohio 45231. Funeral Ceremony will be 11:00 am Monday, November 12, 2018 at Winton Road First Church of God, 6200 Winton Road, Fairfield, Ohio 45014. Burial will follow at Arlington Memorial Gardens. Add your memories to the guest book of Mary Barnhart. God's Blessing for the entire Jackson Family. Our loved ones who move on leave us with nothing but Love. You will be missed Mary. There will never be another Myrtle Barnfart! Love and miss you! To my dearest sister Mary. I will miss you so much. You always knew how much we loved you. Will see you soon . My dear sister-in-law Mary was called home by our Lord. Mary was a very special person. Her sense of humor made it fun to be around her. Mary loved her family with all her heart. Our love and condolences to all who mourn for her. When I think of Aunt Mary, It always makes me smile. She was a funny, warm, genuine person. We talked about alot of things. I loved to hear stories about when she was growing up.. what her parents (my grandparents) were like.. I had alot of questions with that.. The one thing I absolutely loved about her, Is I could talk to her about anything, without judgement or criticizm. She genuinely loved people, and accepted people as they were. I will miss that sense of humor and silliness. Cathy honey my thought and prayers are with you my lifetime friend. So sorry to hear this. ?? And hugs to you . Mary was a very nice lady and her sister Dorothy Brown formerly of here in williamsburg Kentucky and her family have our sincerely sympathy. Mary's laugh, always a great one. Her jokes from time to time always had me in tears from laughing. Was always happy to see her when I visited aunt Kathy an uncle Charles. She was a wonderful woman, and countless times she had her amazing peanut butter fudge made if she knew I was coming. She left many great memories with us all. We love n miss you. ?? All my love to your family, Mary. You will be truly missed and forever remembered. You always made me feel loved and like I belonged. You could sense when someone was hurting and you were always loving and kind to me. You are with our LORD and I know you are in joy and peace. Thank you, Mary, for being you.